It's the day after Easter, family and friends have left, and I've got a fridge full of food. Well, for me the three items I have the most of in my fridge are hard-boiled eggs, ham and mashed potatoes, so what should I do? On Saturday our kids dyed 48 hard-boiled eggs with their second-cousin, so to say I have a few hard-boiled eggs in the refrigerator would be an understatement. So what can I do? One option is Ally's Sweet and Savory Eats's Chopped Egg & Chorizo Breakfast Pizza. 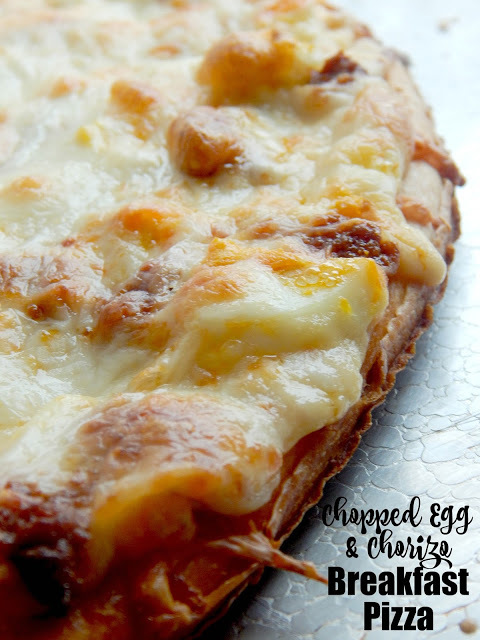 I love breakfast pizza and Ally's version is sure to hit the spot with chopped hard-boiled egg, smoky and spicy chorizo, layered with a cheese sauce! Oh yeah! I can't wait to transform some of my hard-boiled egg leftovers into this breakfast makeover. Next up is ham! We double-smoked two hams for Easter yesterday and I have a couple gallon bags with leftover ham in it. With spring planting on the horizon this week the first thing I thought about making was Jeni Eats's Funeral Sandwiches. These quick, glazed, baked ham and cheese sandwiches are delicious! 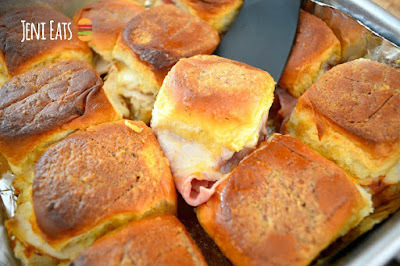 Between everything being melty, ooey and gooey, along with the delicious glaze on top - these have become a family favorite and are perfect for feeding a crowd, or a hungry tractor and planting crew. Last up is mashed potatoes! I made 10 pounds of mashed potatoes for yesterday and while people did a really good job of trying to finish them, I still have some leftovers. So what better way to makeover mashed potatoes other than Shepherd's Pie. 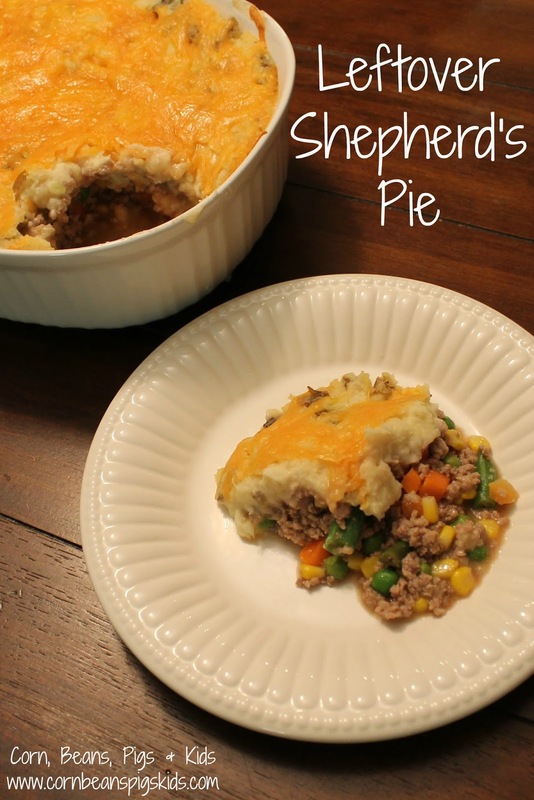 This recipe is a great way to turn your mashed potatoes into another great comfort food. Add in some of your leftover vegetables and some hamburger, and you've got a classic supper ready for your family. So now it is your turn! I've teamed up with my Country Fair Blog Party friends, Jan of The Tip Garden and Nicole of Tales of a Kansas Farm Mom to bring all of you an Easter Leftover Makeover Blog Party. Feel free to link up as many of your posts that would work as a leftover makeover! I can't wait to get inspired by all of your ideas. What leftover are you excited to have in your refrigerator? What's your favorite leftover makeover? Remember to Comment for a Cause. I need to make the funeral sandwiches! I know the boys would like them! Thanks for offering the link-up! I've got everything ready to go for them! We actually had an extra bag of Hawaiian Buns left at our house so it works perfectly for us! Thanks for linking up to the party! Thanks for including my post! I wish we had extra ham this year. Hi, We were busily working on the garden this weekend so we just had a congregate meal that we all enjoyed. No big meal, just fun times. Clear Lake's Yurts - A Family Bucket List Must!